FILE - An Iraqi soldier inspects a former train tunnel displaying the Islamic State group flag, in western Mosul, Iraq, March 1, 2017. The tunnel once served as a training camp for IS fighters. Iraqi lawmakers are demanding members of the Islamic State terror group pay for their crimes, and not just with prison terms or the death penalty. The speaker of Iraq's Council of Representatives said Friday that Iraqis should be compensated monetarily, as well. "The Iraqi parliament will formally demand all countries whose citizens have either committed crimes inside Iraq [or] brought damage and harm to the Iraqi people ... bring those criminals to justice and compensate Iraq for the crimes they did to Iraq and the Iraqi people," Mohammed al-Halbousi told reporters following a speech in Washington. Iraq Council of Representatives Speaker Mohammed al-Halbousi speaks at the United States Institute of Peace (USIP) in Washington, D.C., March 29, 2019. Al-Halbousi, who spoke through a translator, did not provide details about when the Iraqi parliament will make the formal demand or about how the claims would be calculated or filed. During his speech, he said Iraq would also seek to hold the individual foreign fighters liable for damages. "We will ask for compensation from foreign nationals who did hurt Iraq," al-Halbousi said. "This is a right for Iraqis to compensate families who lost their property, who lost their family members." Earlier this month, Iraq began legal proceedings against 14 suspected French foreign fighters who had been captured by U.S.-backed forces in Syria and transferred to Iraqi custody. Legal sources, speaking with Reuters on condition of anonymity, said all 14 had previously signed confessions, admitting they had been in Mosul between 2014 and 2017, when it was under IS control. 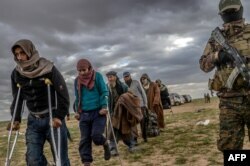 FILE - Men suspected of being Islamic State fighters wait to be searched by members of the Kurdish-led Syrian Democratic Forces (SDF) after leaving the IS group's last holdout of Baghuz, in Syria's northern Deir Ezzor province, Feb. 27, 2019. Al-Halbousi said Friday that more recently, the U.S.-backed Syrian Democratic Forces had turned over about 250 foreign fighters to Iraq. Suspected IS fighters convicted of committing terrorist acts against Iraq or Iraqi citizens are eligible for the death penalty, though al-Halbousi said foreign fighters from Western countries would face justice in their countries of origin. "Western nationals, they will be taken care by their own countries," he said. "Countries know exactly how to apply their own laws and their own justice on their own nationals." A U.S. State Department official would not comment directly on Al-Halbousi’s remarks, but said Washington agrees the pain and suffering inflicted by IS fighters must not be forgotten. “Those who fought for ISIS, including foreign terrorist fighters, and brought damage and harm to the Iraqi people, need to be held responsible for their crimes,” the official told VOA. As part of that effort, a special United Nations investigative team has been on the ground in Iraq, “to collect, preserve, and store evidence of ISIS crimes, crimes against humanity, and genocide,” the official added, using an acronym for the terror group. Senior U.S. counterterrorism and defense officials estimate at least 45,000 fighters from about 110 countries flocked to Syria and Iraq to fight with IS and other groups. Officials say about 8,000 of those fighters are from Western countries. But there are questions as to how many foreign fighters remain. U.S. defense officials have said the majority of the terror group's foreign fighters have been on the battlefield. As of earlier this month, a senior U.S. defense official said more than 1,000 foreign fighters have been in the custody of U.S.-backed forces in Syria. But some SDF officials have indicated the number may be even higher. Both the U.S. and the SDF have been urging countries of origin to repatriate the foreign fighters for prosecution. VOA has reached out to the Iraqi Embassy in Washington, as well as to the Pentagon and to the international coalition fighting IS for additional comment.